Where do you get your food? - JP loves LIFE! The discussion we have so frequently about where our food comes from… I know you know your food comes from farms and ranches, but I’m wondering what’s the last touch point before it gets to you. So this poll is a bit easier than most…. and you can select more than one answer! But to make it easier to show trends, I do want to ask folks to stay to their top two or three. In this case the spices in the window box don’t count for me to say I’m producing my own food. Amy & John Rediess are the butchers behind John’s Custom Meats in Smith’s Grove, Kentucky. They also raise some of their won beef. Amy is one of the folks I met early on in talking through ag topics on Twitter. They have an active social media presence — and she’s willing to provide a lot of perspective from the butcher/specialty side of things. You can read their blog and get a feel for some of the info she shares. Their Facebook page keeps you up on the day-to-day. Her twitter feed can be seen (and usually a few smiles result from) as @KYFarmersMatter. Jan Hoadley has a small farm operation called Slow Money Farm. She’s got a wide range of things she produces on her farm — herbs, vegetables, chickens, rabbits, etc. She has an active social media presence too and is looking forward to increasing her knowledge on how to be come more effective in the upcoming Agvocacy 2.0 training by the AgChat Foundation. Jan’s blog shows some of the wide diversity of being on a small farm. She’s also got an active Twitter feed as @SlowMoneyFarm. I actually worked for a grocery store through high school and college. I can remember stocking things on the shelves for sales, ringing folks up at the cash register, even bagging and carrying out the groceries to cars. Growing up in Memphis, grocery stores were not only the way we got the vast majority of our food, its ingrained in our history. I learned early that the grocery stores we have today are modeled after a revolution by Claurence Saunders when he created Piggly Wiggly. You can read a bit about that history on their website and if you come to visit me in Memphis, we can go to the house Saunders built which is now the museum called the Pink Palace. Okay…. I’ve given you clues about a few of the choices in poll… I know very few of us get our food from one place, so on the poll I’m making it so you can pick up to three answers! 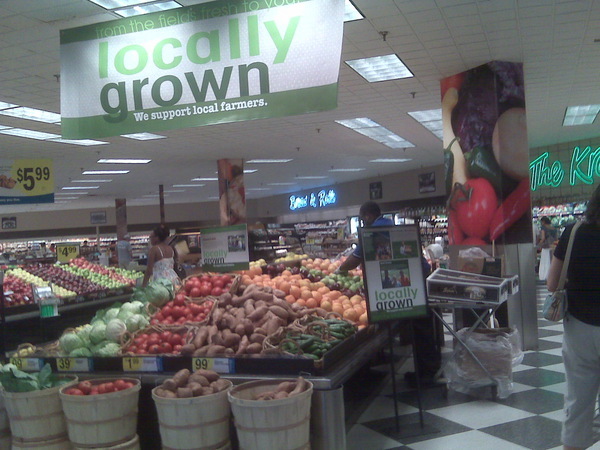 I frequent local farmers markets, neighbor farmers, neighborhood grocery stores, and even grow my own. I am also fortunate to have great family and customers who bless me with their bounties from the gardens and their kitchens. Even my USDA Inspector brings me goodies from his garden. Its a good life. Thanks for the mention! It’s tough for all involved in farming on any level to look at now, a month or six months from now, a year from now and 5-10 years from now…and make that all come together in a plan!! Constantly wish we had more room but will sure make effective use of it when it comes! Enjoyed the blog written by a social media friend mentioning two of my other social media friends! My food and the food for my family comes for about every possible avenue…. I have a garden, we raise beef, I like to get my pork when possible from a small semi-local store, I stop at a farmers market anytime I see one and have the time-especially for seasonal produce. BUT sometimes I get my produce at Walmart or Aldi’s. Because I can’t shop much it makes sense to utilize some frozen foods and our favorite frozen fish comes from Aldi’s who’d of thunk it? :-} I make no excuses, explanations or apologies! I feel good about all my choices and my choices for my families food. I think most of us have several sources! The grocery is my big one but I eat out a decent amount, shop at farmers markets, get fresh veggies from my sister’s garden, love my local produce market, etc. Wow… I really love food! Great poll! Thanks for all each of you do! You are ROCKIN it!